1. Pressure cook all ingredients corn, ginger, chilli and shallots add cup of water to 3 whistle. or You can also cook them in the big pot as well. 2. Discard that ginger and chillies. Reserve some corn in a bowl seperately. 3. Grind other corn in a blender to smooth and strain it. 4. Then heat it by adding milk according to desired thickness or the soup. 5. Add salt and pepper , add chopped coriander and butter for garnish. 6. Add those reserved corns to the bowl. serve hot. 1. If your very concern about butter you can add 1/2 tsp of sesame oil it gives nutty flavor to the soup and it is very healthy as well. 2. Add milk if necessary to adjust the consistency. If you are doing this for more people dilute it and add cornflour for thickness. wata dish! looks so gud and rich..
Looks very rich..Nice color to it....Loved that thin white string kind thing.. It sounds so delicious and looks pretty too. What gorgeous color and presentation..fabulous!!! 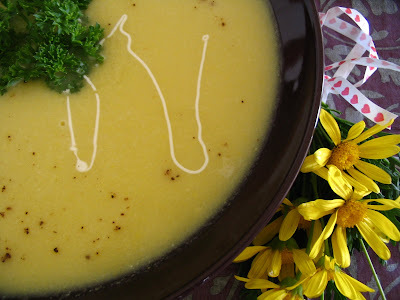 Lovely creamy corn soup! With garlic bread this would taste heavenly! Great presentation too! A delicious looking soup! I love that kind of dish! Gorgeous soup we love corn and this sounds so tasty - fabulous presentation. Excellent soup! I adore the way you present a dish and capture by a click! Awesome..
Hey Pavitra, have you made this for this sick baby oh how comforting and nice if I had some now!!! haha really a designer soup.....lifeline in the middle! 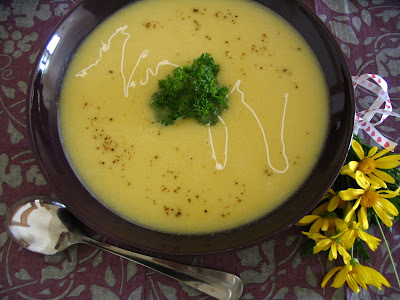 The corn soup looks awesome - pretty garnish too. Again wonderful recipe with even more wonderful presentation. Can we use frozen corn ? corn soup looks restaurant perfect. 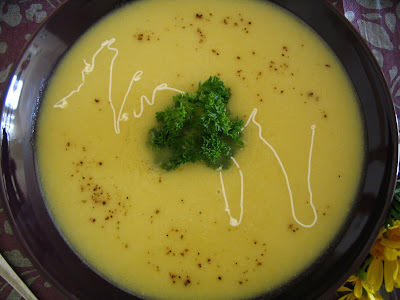 Corn soup looks awesome..what a presentation.. I must say..Looks just lovely. Lovey soup Pavitra..liked the presentation with ur design,lov the addition of shallots in corn soup..
What a perfect dish for a Sunday brunch Looks :Delicious! Looks creamy and rich.... Delicious recipe. that soup looks delish.. nice garnish..
nice ones and thanks for dropping by.....we learn so much from each other......keep in touch.. I just one suggestion about this post. It would be more visible if you can change the font color to a darker one. This one is too light to be visible.